Recognizing that hermeneutics is “one of the hardest subjects to teach,” Köstenberger and Patterson dedicate this volume “to all serious students of Scripture who are willing to do whatever it takes . . . to understand God’s Word and to teach it faithfully to others” (p. 21). They characterize their approach as a “simple method” for biblical interpretation that involves “preparation, interpretation, and application” (p. 23). The theoretical foundation undergirding these practices is the “hermeneutical triad” of history, literature, and theology. This three-part focus lends itself to a “core proposal,” namely, that “for any passage of Scripture, you will want to study the historical setting, the literary context, and the theological message” (p. 23). 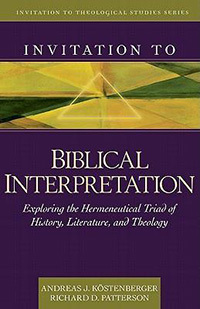 These three areas “form the proper grid for biblical interpretation” (p. 23). The “interpretive task,” in other words, should reflect this “triadic structure” (p. 25). In Köstenberger and Patterson’s navigational metaphor, the hermeneutical triad functions as a “compass” on the “interpretive journey through the canonical landscape” (p. 29). In this regard, a pedagogical strength of the book is that its structure reflects the hermeneutical triad’s emphasis on history, literature, and theology. After an introductory chapter, part one treats the “context of Scripture: History” (chap 2). Part two highlights the “focus of Scripture: Literature” by examining the areas of canon (chaps 3-4), genre (chaps 5-11), and language (chaps 12-14). This section on the literary features of the Bible forms the heart of the textbook (pp. 145-688). Part three touches on the hermeneutical “goal: theology” (chap 15). A chapter on application and proclamation concludes the content of the book. Drawing on their extensive experience as seasoned professors, the authors have designed this volume for use in the classroom. To this end, they provide a helpful “personal note” to educators that outlines the way the book can be used during the course of a semester (pp. 23-29). They also include summaries, outlines, key words, study questions, and possible assignments for each chapter. Though most of the volume is written in a clear and straightforward style, there are a few areas where technical discussion becomes dense or difficult. For instance, in the space of about one page the terms ellipsis, zeugma, aposiopesis, brachylogy, hendiadys, and pleonasm are introduced with only minimal interaction (pp. 590-91). In light of the volume’s clear macrostructure, a few structural issues stand out. For instance, the chapters on the canon of the Old and New Testament are structured in different ways. The discussion of the New Testament follows the major groupings of Gospels, Acts, Epistles, and Apocalypse. The Old Testament section, though, is ordered around the themes of law, exodus, covenant, and Messiah. Though these thematic areas are clearly central in the Old Testament, ordering this material under the headings of Law, Prophets, and Writings (which is actually the chapter’s subtitle) might better parallel the chapter on the New Testament and launch naturally into the formal treatment of genre in the following section. Further, chapter 16 perhaps attempts to cover too much ground. The homiletical emphasis of the “from study to sermon” section focuses on crafting a sermon based on the contours of the text. Because of the textual focus, the content of these sections might have been better integrated into the previously developed sections devoted to the various biblical genres. The mentioning of time-sensitive online material also guarantees that this section will be quickly dated (e.g., the nature of Google books, Wikipedia, and the development of e-book technology). Moreover, professors who want to integrate a more robust history of interpretation into their course will need to supplement this volume. The authors do survey the major historical eras, but this treatment is brief (pp. 67-78) and designed to highlight the broad role of history, literature, and theology in these periods. A fuller account of the history of interpretation might have rounded out the “History” section of the book. A related issue is the particularly prominent role that Köstenberger and Patterson give to historical background information as it relates to the interpretive task. Chapter two surveys the type of sources used in reconstructing the social/cultural world of the biblical events, and similar historical background material is highlighted throughout the volume. Because there is often a tendency among casual interpreters to overplay the importance of this type of information and to misapply its hermeneutical significance, a more developed discussion of the caution necessary in this area would have served readers well. Köstenberger and Patterson seem to recognize this tendency as they occasionally sound this warning. For example, in their discussion of preaching wisdom literature, they mention that “importing foreign historical or background information is a mistake” (p. 767). They also briefly caution against the fallacy of appealing to “unknown or unlikely meanings or background material” (p. 635). However, there is only minimal discussion devoted to the way in which one might go about determining what exactly makes a given piece of background information “unknown or unlikely.” Because this hermeneutical issue is crucial and fraught with difficulties, professors will want to supplement these sections with another resource or at least further develop the brief “guidelines” Köstenberger and Patterson do provide (e.g., the abbreviated aside on p. 128). A final point about this new approach is that it is not a “new approach” at all, as Köstenberger and Patterson themselves acknowledge (pp. 23-25). The authors adumbrate the way their triad relates to the other popular “geometric figures” utilized in hermeneutical theory (the hermeneutical circle and the hermeneutical spiral). Because the approach is not totally novel, however, it is able to incorporate a large swath of scholarship from recent areas of research (e.g., canonical theology, literary studies, and discourse analysis) as well as the key hermeneutical insights of previous historical epochs (e.g., the Patristic and Reformation period). The triangular image is also helpful in highlighting the dialectical tension that should exist between these three areas of interpretation. Moreover, the section on genre is particularly well developed and, alongside the chapters on canon and language, provides a thorough and thoughtful introduction to the textual contours of the biblical literature. Fully integrated into this volume is an emphasis on “special hermeneutics” and the divine qualities of Scripture. This feature works well within a confessional approach to the Scriptures and will resonate with Evangelical readers. The authors seek to grapple with the textual, linguistic, and historical issues unavoidably impinging on the interpretive task while tightly holding on to a high view of the texts they are interpreting. This particular feature of Köstenberger and Patterson’s “invitation to hermeneutics” is one I hope many interpreters will accept. Review also appears in Trinity Journal 34, no. 1 (Spring 2013): 123-25.